The famously infamous park in Los Angeles bundled by Wilshire Blvd and identified as a spot where the undocumented can become documented with $50 bucks and a passport sized photo. Drugs, crime and gangs. Yup, I’ve heard it and/or read it too. How did a place once known around the country as a vacation destination become the center of illicit activity and negative energy? The bright lights of downtown eight blocks to the east wears a new face, filled with young professionals, urban sprawl and plenty of entertainment options. 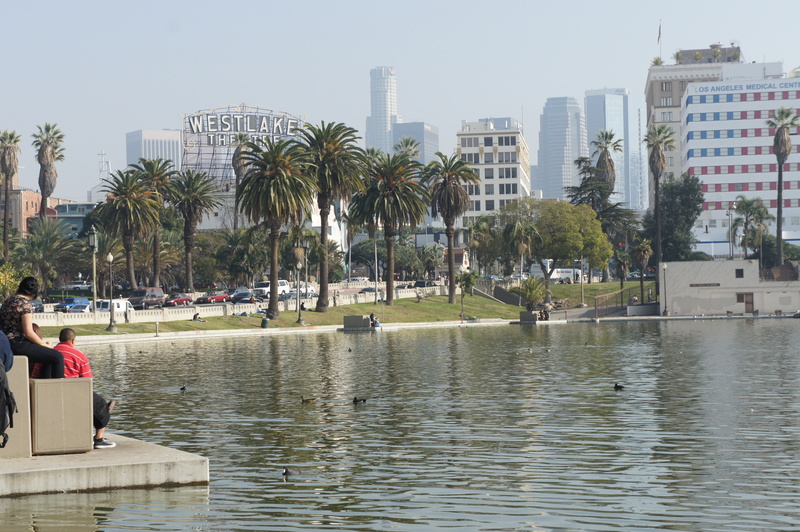 Formally known as Westlake Park, MacArthur Park has a storied history. When I lived in a loft downtown, the park was always close enough to see, but just far enough away to avoid. No reason for me to go, until of course, I found a reason to go. What was that reason? Simple, I’d never been there before. Sure, I’ve driven through on my way to more desirable destinations many times. On this day, I didn’t know what to expect and I’m glad I set no expectation for myself. My palate was blank so the park could rise to the occasion of my judgment. Saturday came and Saturday I arrived. People. Color. Language. Smiles. Community. Song. Dance. Sport. Work. Play. All in constant motion. The park is split into two unequal halves with a short tunnel connecting both sides running below Wilshire Blvd. The tunnel is filled with visual expression. There’s a lot of concrete used as canvas in and around LA, but the tunnel behaves as a reminder that talented visual expressionists surrounds us. I wonder how long those images have remained untouched? I wonder who the artist is? I wonder if anyone’s ever said, “thank you?” – Thank you. The lake dominates the south side of the park where birds bathe and children find joy in feeding them by hand. I imagine this ritual began a century ago. The rim of the lake provides a path for walking which was in full use. Women talking in Spanish about their husbands walking briskly; runners pacing themselves to their own musical rhythms around a lake serving far fewer functions than it did in its heyday. It’s no longer a source of drinking water for the city but it’s still the center of attention. To the north you’ll find room to stretch. Families enjoying picnics were sprinkled all around. A playground sits on the shoulder of a fresh soccer field in full use. A league of adolescent kids all in uniform and all excited to run, jump and hear their names called by their audience of support. The soccer field is built like a bowl allowing a great view anywhere you choose to settle and watch. The outdoor amphitheater was in a state of restoration with LA City workers plotting to return the stage to its glory days. Summer concerts are the vision of the future. Having traveled to Paris a few years ago, I experienced the excitement of the main and most famous thoroughfare. As I stood in the middle of Wilshire blvd taking photos, I began to understand why this area was once referred to as the Champs-Élysées of Los Angeles. Many years ago, a vacation near the park was the symbol of privilege. The prestige is long gone but the history of this park remains and continues to write itself. Yes! You guessed it; another blog to add to the millions of threads and message boards the Internet has to offer. Just what you wanted… one more URL to search with another link to click right? We all have a voice filled with our own experiences that we can project beyond our own circle of listeners. I approach this project with the intention to share my love of visual storytelling and my desire for learning new things. Feast and famine. A term often used to describe extreme opposites – all or nothing if you will. It’s also a very good sports-catch phrase which always seems to elicit a heightened sense of urgency to win at all costs. In basketball the sport I love, either you GO GET IT! Or – you get nothing and that always seems to work right? I’ve always seen Los Angels as a city that presents both sides of the coin. My goal is to share with you my experiences and how they continue to help shape and teach me. I hope to bring myself closer to this uniquely diverse, yet complicated city. There is so much to experience and much, much more to discover. Feast and famine surround us. We all form our views and perspectives in a variety of ways; family, friends, television, news, radio – the list goes on. What makes a good or bad neighborhood? What’s safe and what’s not so safe? These concepts are largely packaged and presented to us to choose and most often, we make a choice. As we all mature, we embrace our comfort zones even more which makes it easy to lose your appetite for growth. The path of discovery and learning narrows unless we continue to drive with our head out the window. Continue to dance like no one is watching. Continue to make mistakes. Continue to push your boundaries and more importantly – continue to laugh out loud. If you’ve lived in Los Angeles and you’ve never been to MacArthur Park on a sunny Saturday as the community gathers to watch children play soccer and learn life skills or, visited an elegant indoor market in Santa Monica to experience good food & wine – ask yourself why? Better yet…ask yourself why not? I asked myself those same questions and discovered that my answers were not good enough. I wasn’t as fearless or diverse as I imagined. I needed to venture out. I needed to enjoy. I needed to learn and I needed share. This city is filled with art, history, culture and people who provide us with opportunities to learn more about them and more about ourselves. As I learn more about myself, I invite you to join me. Expression is the best way to teach and to learn. I hope to inspire you. I hope you inspire me! It should be stimulating and fun!..